Hello! I know that it's been a while since I last posted but that is because I was gone Tuesday, Wednesday and Thursday for my PhilaU student orientation. Overall, the orientation was really enjoyable- I got to see a little more of the city, make a bunch of new friends and learn more about the school and academic program. Not to mention I got my schedule for first semester! No Friday classes- how lucky is that? Unfortunately, I did not take any photos at orientation so I don't have any to share with you guys. Anyways, today's outfit is featured in the photos above. 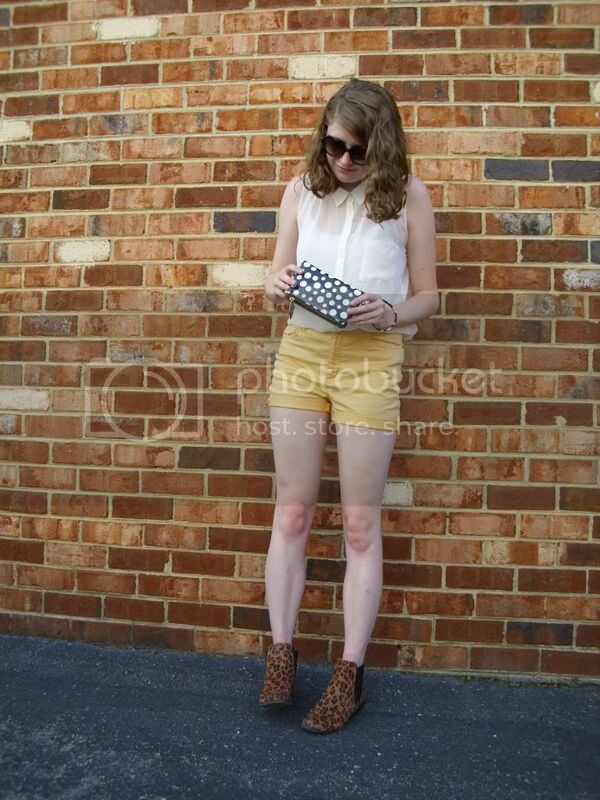 I began my look with these sunflower yellow shorts. These shorts are absolutely perfect for summer. 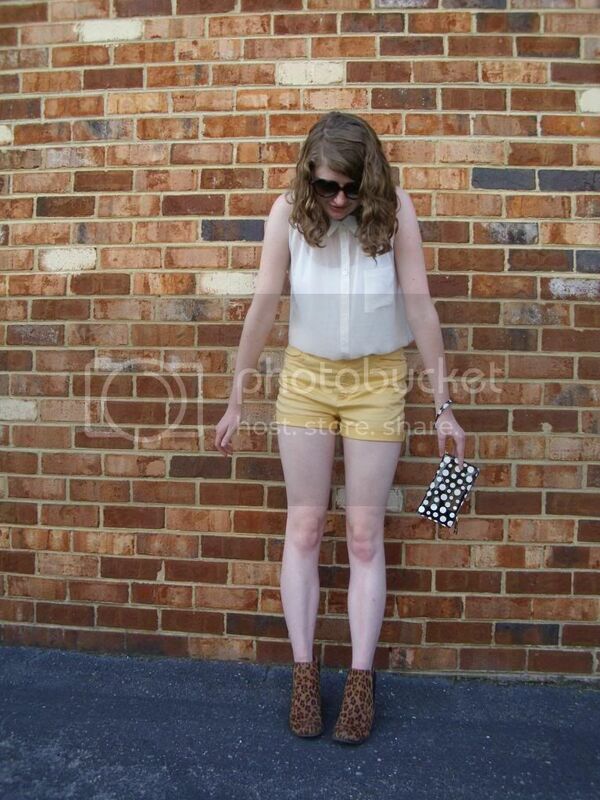 Cuffed, studded and light weight- what more could I ask for in a pair of colored shorts? 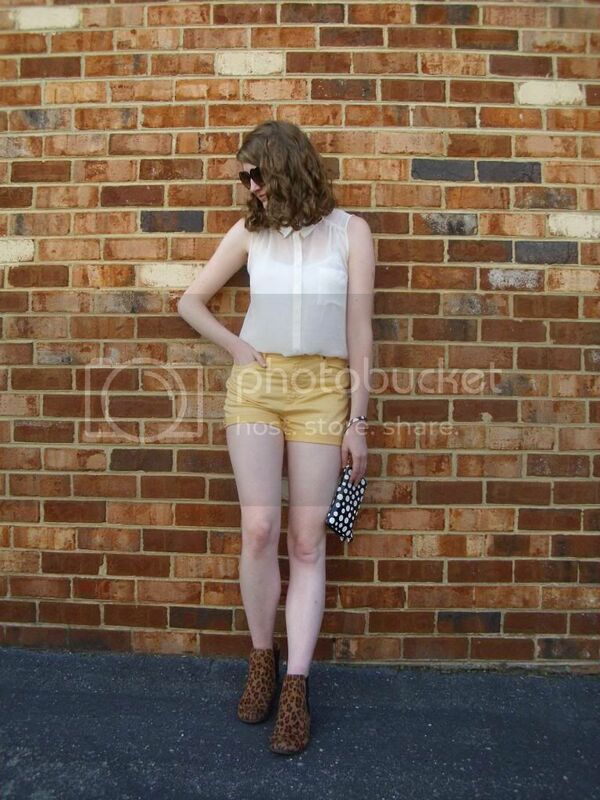 I paired the shorts with a sheer white blouse. Of course, I couldn't resist throwing a few patterned pieces into my look and donned leopard print boots and the most adorable polka dot wristlet. Black heart sunglasses pulled the look together. I hope that you guys are enjoying your summer! 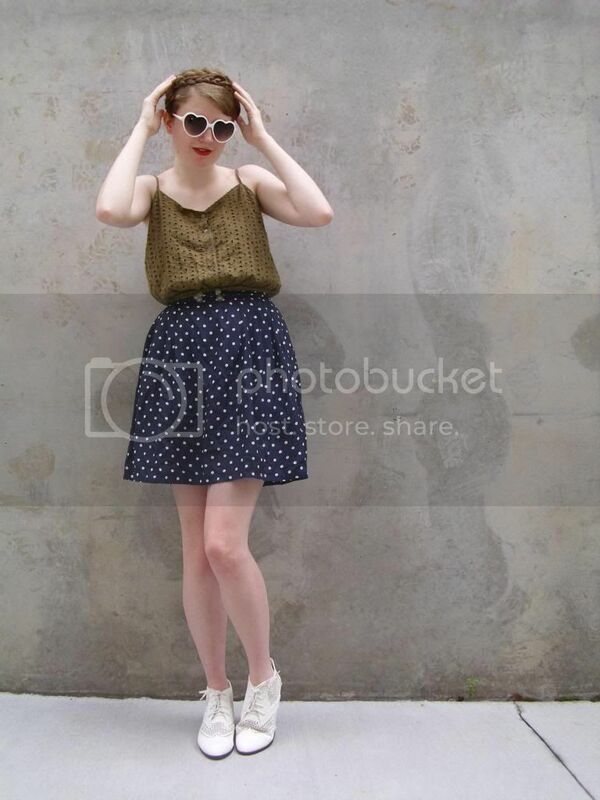 Oh and the winner of my $35 Giant Vintage Sunglasses Credit is Jena Douglass! Check your email for a notification from me about the giveaway. Congrats! ***Also, one last final plea to follow me on Bloglovin' or subscribe via email. Beginning July 1st, there will be no more GFC so if you would like to continue receiving updates when I post, you should follow me in another manner besides with GFC. It's kind of sad- I will go from having 570+ followers with GFC to less than 200 followers with Bloglovin'. Oh Google, why do you do this to me?! Hello! Today, I present to you an online shop full of boho-glamorous, eclectic jewelry- ÉVOCATEUR. Although they sell a few belts, ÉVOCATEUR sells mainly jewelry. They have a wide range of different types of jewelry from bracelets to earrings to necklaces. And boy, do they have a lot of different collections! In all, there are 20 different collections including an "on trend" collection" and a "very vintage" collection. The "very vintage" collection is one of my favorites. Describing the style of jewelry that ÉVOCATEUR carries is hard primarily because they do carry such a wide range of jewelry. Like I said earlier, the pieces are mainly boho-glam mixed with some great classic pieces (see the "very vintage" collection) and sophisticated, tribal pieces. ÉVOCATEUR jewelry is very bold, very show-stopping and is sure to add a "wow" factor to any look. ÉVOCATEUR pieces feature 22K gold leaf and sterling silver leaf. Talk about luxe! Prices range from $98 to $498. I have selected my three favorite ÉVOCATEUR pieces to share with you guys today. 1. Venus Necklace. $98. Although this piece is simple, its beauty is striking! This necklace would look great layered with other necklaces or on its own. 2. Milano Cuff. $218. Such a brilliant gold cuff! 3. Copenhagen Teardrop Earrings. $138. These earrings emanate poise and sophistication. ***Disclaimer: evocateurstyle.com provided monetary compensation for this post but I wrote the actual post and all opinions written in this post are mine. Hello! 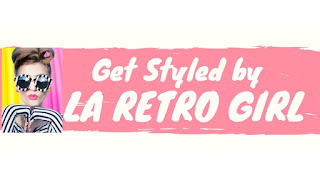 Today, I am excited to bring you a giveaway hosted by one of my favorite shops, Giant Vintage Sunglasses. Giant Vintage is giving you the opportunity to win a $35 credit to spend on any sunglasses that you desire from their online store. And trust me, they have a lot of options! They have all of my favorites- cat eye, heart shaped, classics, etc. You name it, they have it! Giant Vintage carries sunglasses for both guys and girls so this giveaway is perfect for all of my readers. In order to enter, you must use the Rafflecopter widget below. Rafflecopter allows me to organize my giveaways easily and ensures that a winner is picked randomly. 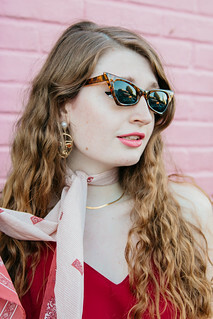 There are two mandatory entries: you must follow my blog with bloglovin' and leave a comment with which pair of Giant Vintage Sunglasses are your favorite at the bottom of this post. 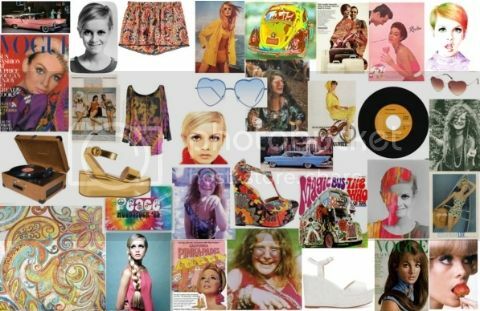 If you would like to gain additional entries (which would give you a better chance of winning), you may like Fashion, Trends & More on Facebook and/or follow Giant Vintage on Twitter. Now, what are you waiting for? Go ahead and enter! Giveaway ends 6/29. Hello! I was lucky enough to be featured in Links A La Mode for the Week of June 13th. Check out all the other links for more great articles. You won't be disappointed! One of the things I love the most about blogging is that there are both actions and reactions in content. Action: making, creating, styling. Reaction: commentary, reviewing, dissecting. It satisfies both the heady space fashion can sometimes occupy, as well as occupying our two little hands. This week we have a great combination of things you can do and things to think about, and heck a couple of things you can put on your summer wishlist. Buy Any Means Necessary: 7 Jumpsuits To Jump For! Christie Moeller: Logo Shirts, Say What? Fashion Moriarty: Fashion Journalism: the preserve of the elite? Hello! As you guys know, I recently graduated from high school.My summer will be filled with lots of fun (remember my bucket list?) but also lots of planning and preparation for Philadelphia University. Summer orientation, filling out health forms and dorm room shopping among other things are all on my summer to-do list. My favorite thing to prep for college next year? Building my perfect college wardrobe! However, building my ideal wardrobe requires a fair deal of work on my part. I have already begun to go through my closet and get rid of the pieces that I feel as though I no longer need. There is this huge mountain (okay, more like a molehill) of unwanted stuff piling up by my door. Soon it will all be dismissed from my possession. The next step would be going through my wardrobe and deciding which pieces that I would like to bring with me next year. Again, I have also begun this step. By deciding what I am bringing with me and seeing what I actually have, I can begin to make a list of items that I feel as though I "need" for next year. I have not made that list yet but have been pinning items for the past few months now that I think would be great additions to my college wardrobe. My wardrobe wishlist for next year consists of more eclectic, more creative and edgier pieces than the pieces that composed my wardrobe this year. 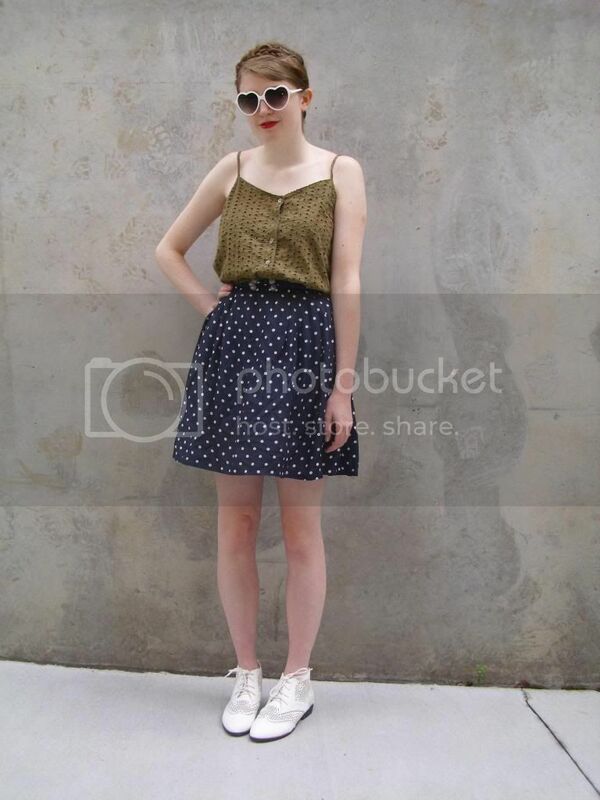 Downtown-cool pieces that scream "fashion student" reign superior. However, many versatile pieces also preside on my wishlist. Since I will have a limited amount of space for my clothing/shoes/accessories next year, the best pieces to bring with me are pieces that I will wear repeatedly and that I can style in an entirely different way each time that I wear them. 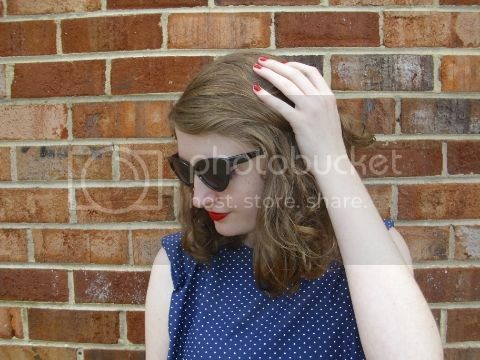 For example, I recently bought a basic black and white polka dot mini dress. 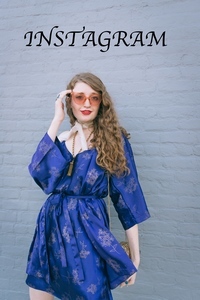 There are numerous ways that I can style that dress; it would look great with a camo jacket, leopard print cross-body bag and sky high platform heels or with a quirky vintage sweater and combat boots. Specific items on my wishlist include a pair of Doc Martens, Lana Del Rey tank top, Great Gatsby top, Jeffrey Campbell rain boots, patterned dresses and crop tops. Any items that you guys would consider a wardrobe must for college? Follow me on Pinterest HERE to keep up with my latest inspiration and college wishlist. Hello! Last night, I finally graduated from Godwin High School after four long years filled with numerous classes, tests, projects, fire drills and assemblies. These past four years have definitely been filled with a few great memories and amazing friends but it is most certainly a joy to be done with high school! I am ready to move on to the next stage of my life; to move to Philadelphia to attend PhilaU and major in fashion merchandising and minor in fashion journalism. Best of luck to all of my fellow grads! Featured in the photo above is what I wore for my graduation. My school required that all girls wear a white dress and white shoes to match our white caps and gowns. 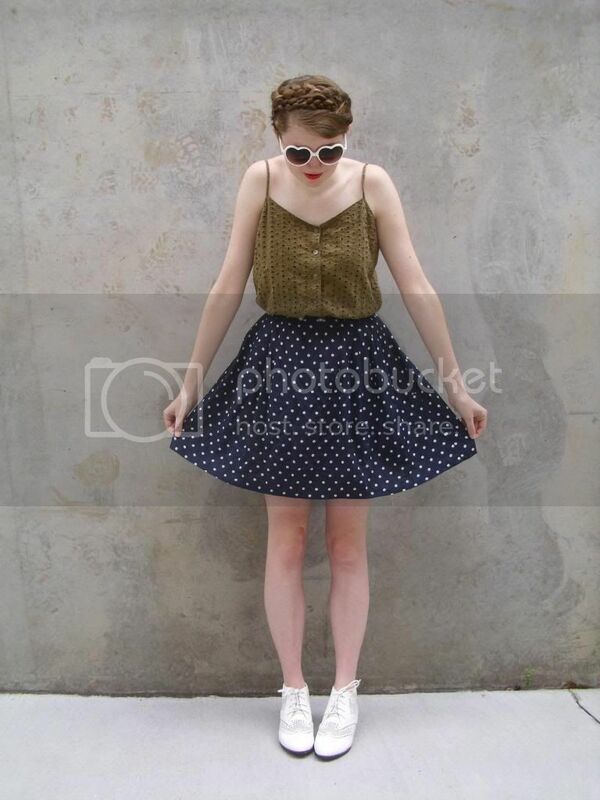 My dress is from INDRESSME and my shoes are from Urban Outfitters. Boy did it take me a long time to find this dress and these shoes! Actually, finding the dress wasn't too bad. My mom led me to the site in which I discovered the dress. Since the site is lesser known, I figured that no one else at my school would be wearing the dress (and no one was) and thought that I might as well get it. Next, I scoured the web (Forever 21, ASOS, Topshop, Urban Outfitters, Nasty Gal, Lulu's, etc) for seemingly ever to find a pair of shoes. No such luck. My mom ended up picking these boots up at an Urban Outfitters sale and I just decided to go with it. For my beauty preparations, I decided to go bold with red lipstick and red nails while I left my hair completely natural. Hello! 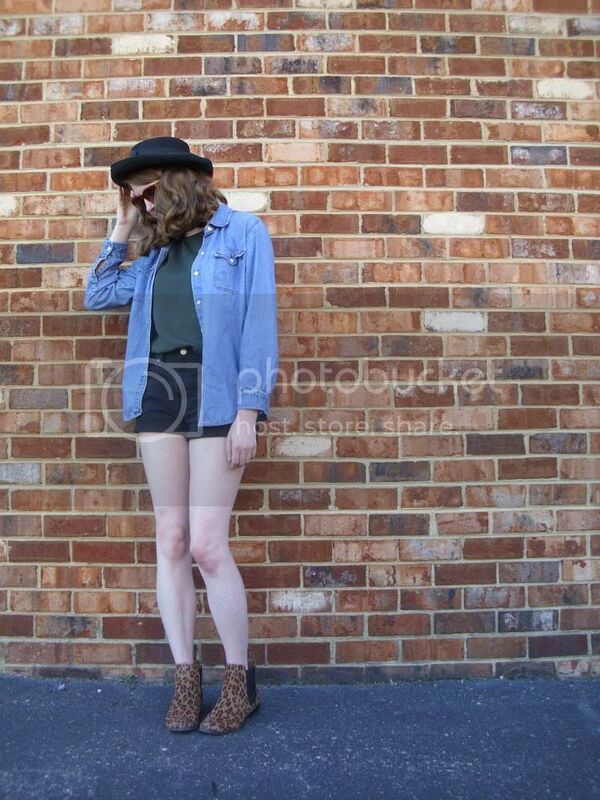 As you guys have probably noticed from my outfit posts, I am an avid thrift shopper and lover of all things vintage. Whenever the opportunity to go to a thrift shop, yard sale or estate sale presents itself, I jump at it. Today, I am going to share my best thrift shopping advice with you guys. I know that I've shared some advice on how to look "cute on a dime" in the past but never explicitly shared my thrifting tips and tricks. Enjoy! 1. Go early. The early bird gets the worm! Thrift shops, yard sales and estate sales typically have the best items for sale earlier in the morning. As more and more shoppers pass through the sales, more and more items are purchased, leaving less up for grabs. Ideally, you would go to a few yard sales first (between approximately 8 and 10 AM) because yard sales start first. While driving to yard sales, you should also keep your eyes open for estate sales and visit those along the way. Lastly, you would visit a few thrift shops (the ones near me usually open around 9 or 10 AM, just check online before you head out in the morning). 2. Look for discounts. Many thrift shops have days when items cost only a dollar or items with certain colored tags are ____% off. These discounts reduce some items to practically pennies. Alright, maybe not pennies but you get my point. They make many items even more affordable. 3. Examine clothing for rips and stains. This is an absolutely crucial step when shopping second-hand! 4. Check out estate sales on Sundays. Often, merchandise is between 25% and 75% off at estate sales on Sundays. 5. Look through merchandise thoroughly. Dig to the bottom of that box, you never know what may be in there; perhaps your new favorite scarf or a gorgeous pin is hidden down there. 6. Search for yard sales before going out on Saturday morning. This can be a great time saver as you won't be driving about aimlessly on Saturday morning looking for yard sales and estate sales. Instead, look for signs as you drive about in your area throughout the week for upcoming yard sales and make note of where they are located. You can also check on sites online like Craigslist for upcoming yard sales and estate sales. 7. (Don't) Buy something only because the price is right. If it is damaged or you don't know what you will use it for or if you will use it at all, leave it where it is. If you do purchase it, there is a good chance that it ends up at the next yard sale in which you are the host. 8. (Don't) Pay for something that costs 50 cents with a $20 bill at a yard sale. Bring change! Yard sales are a great time to get rid of your dimes, nickels and quarters because of the super low prices. 9. (Don't) Give up because you don't find something at the first yard sale/ estate sale/ thrift shop that you stop at. Who knows what you will find at the next stop? 10. (Don't) Be easily overwhelmed by the massive amount of merchandise present at the yard sales, estate sales and thrift shops. Focus on one section of the sale at a time. 11. (Don't) Rush. Thrifting takes time and patience. But the unique pieces and cheap prices definitely make it worth it. I hope that these tips will help you on your next thrifting adventure! Any other advice that some of my frugal readers would like to offer to yard sale/ estate sale/ thrift shop newbies? Hello! These black shorts are officially my new favorite shorts in my wardrobe. The color matches absolutely everything and I cannot resist the high-rise fit. 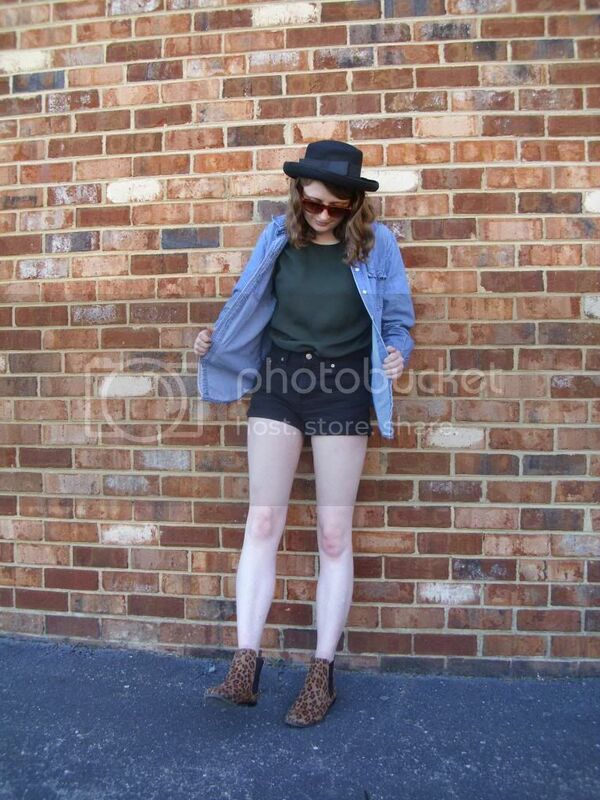 Today, I tucked a dark green sleeveless blouse into the shorts and layered a denim button down over top of that. My adoration of various prints and patterns pushed me to wear my leopard print boots. After all, how could I go a day without wearing a single print or pattern? I kept my accessories to a minimum, only donning a classic pair of sunglasses and a black hat with my look. Now onto a slightly different topic. As you guys know, I love shoes. Heels, boots, oxfords, it doesn't really matter which type because they are all winners in my book! Shoes have the potential to "make" (or "break" for that matter) an outfit. This can be seen in my look today; without these leopard print boots, my look would be kind of boring. And of course, we couldn't go around barefoot. Hey, "no shoes, no service." But on a more serious note, shoes do more than just perfect our looks and allow us into various stores and establishments. Shoes play many important roles. Heels have the ability to provide that extra boost of confidence that you need while flats provide comfort for a day spent on your feet. Boots keep your feet warm during the winter while sandals let your feet breathe in the summer. And I think that we all have that pair of shoes that makes us look and feel like a million bucks. However, it isn't always easy to find your perfect pair of shoes. I am very picky about my shoes. Small details like the color of the laces on a shoe or the texture of the shoe play a huge part in my decision of whether or not to purchase a shoe. That's why I was thrilled when Shoes of Prey emailed me regarding a potential collaboration (if this blurb gets a positive response, then the wheels of our collaboration will begin to spin). Shoes of Prey lets customers design their own shoes. Yes, you heard me correctly! The site lets you design your own shoes- how wild is that? You can choose the type of shoe (heels, flats, sandals, etc.) and then focus on customizing the features to your liking. You can decide how tall you want the heel to be, the color of several different parts of the shoe and so on. Shoes of Prey provides customers with the opportunity to create their own perfect shoe. They take dressing to express yourself one step further. Design your own pair of shoes with Shoes of Prey HERE. Read more about Shoes of Prey HERE. **Shoes of Prey did not provide me with monetary compensation for this post but if there is a positive response from my blurb about them, then we will begin a collaboration. If we end up collaborating, I will be sure to let you guys know. Hello! 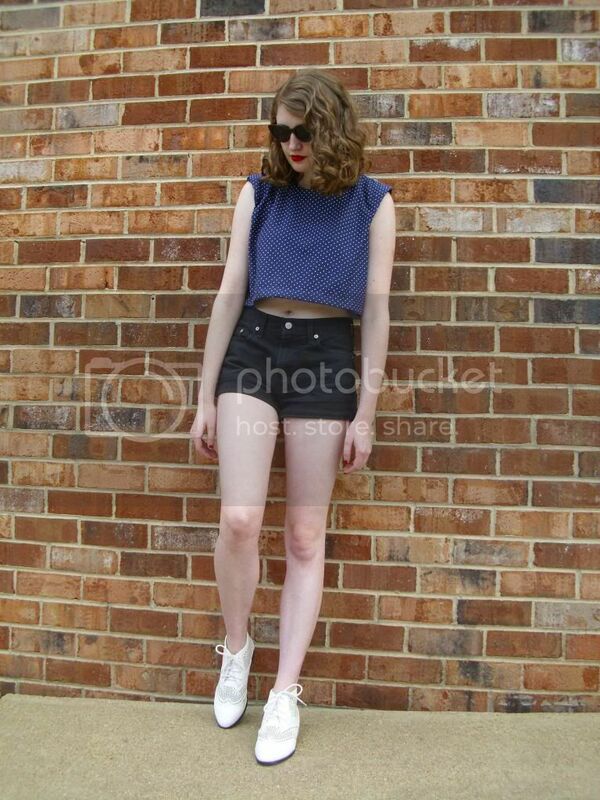 As summer begins to dawn upon us, I start to ask myself what my style will be like this summer. Last summer, my summer uniform consisted of airy pastel pieces, flower crowns and heart sunglasses. The summer before, lightweight dresses and fun colors composed my summer attire. This summer, simplicity will dominate. Stripes and neutral colors will be my go-to styles. That minimalist mind set presents itself in my look today. 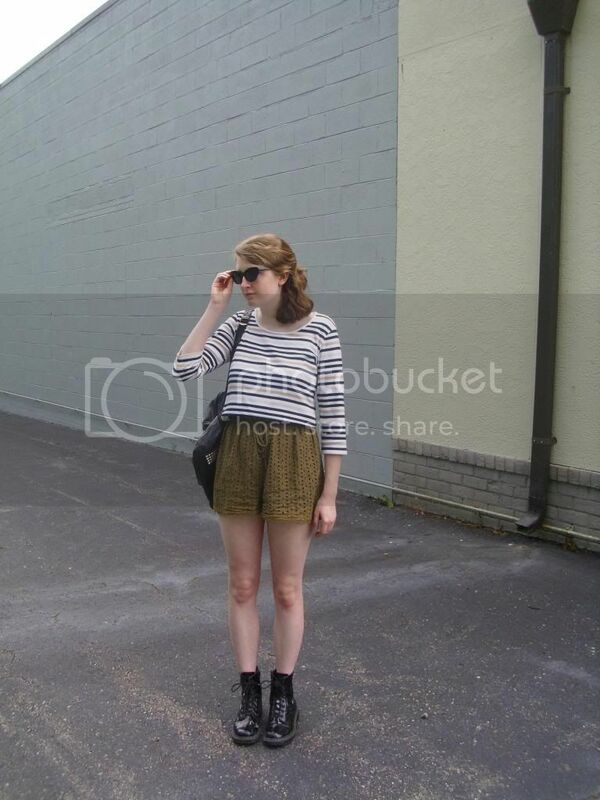 I styled my look around this olive green romper. This romper has saved me time and time again when I cannot figure out what to wear. You can see how I have previously styled it here, here, here and here. Why is this romper one of my favorite pieces in my wardrobe? It is a great piece for layering and if you know me, you know I have a slight obsession with layering. 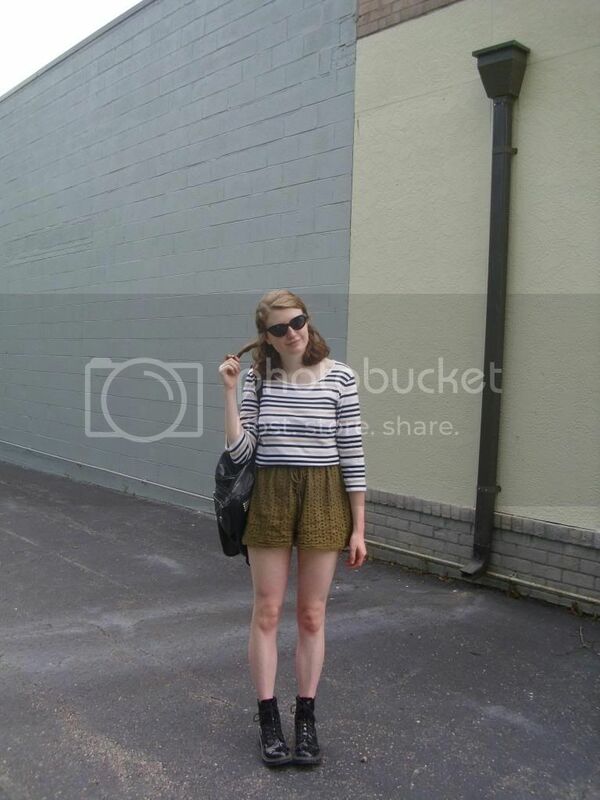 Today, I layered a striped shirt over the romper. Stripes are the epitome of style and I cannot resist the urge to wear stripes over and over again this season. A black backpack, cat eye sunglasses and combat boots perfected the look. **I am linking this post up to IFB's Weekly Project #98: What's Your Summer Style?